In the popular imaginary they represent the dream of almost all the lovers of the sea. 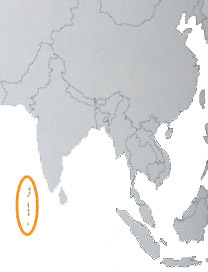 It is a nation constituted by 20 atolls for a general number of over 1.000 islands, of which more than 200 inhabited. The islands, flat, corallines, just elevated on the level of the sea, they are hemmed of palms and of thin sand and they overlook on crystalline lagoons from the splendid colors. The amount of the islands determines a general surface little greater than the Elba island, but with a population next to 300 thousand inhabitants, with a density that grazes the 1.000 inhab./Kmq. The economy primarily founds it on the Tourism (villages all inclusive, sun sea, sea alone) and in smaller measure on the fishing and the coconut palm.